Deformity Cases — Kenneth T. Kaan, M.D. Idiopathic scoliosis is a three-dimensional spinal deformity of unknown cause and generally develops in middle or late childhood during growth spurts. It requires surgery, under rare circumstances, when the curves are severe (typically more than 50 degrees.) Via current techniques, excellent correction of the scoliosis may be obtained with minimal risk. Visit eOrthopod for more detailed information about scoliosis. The case below shows a twelve-year-old female with severe scoliosis. 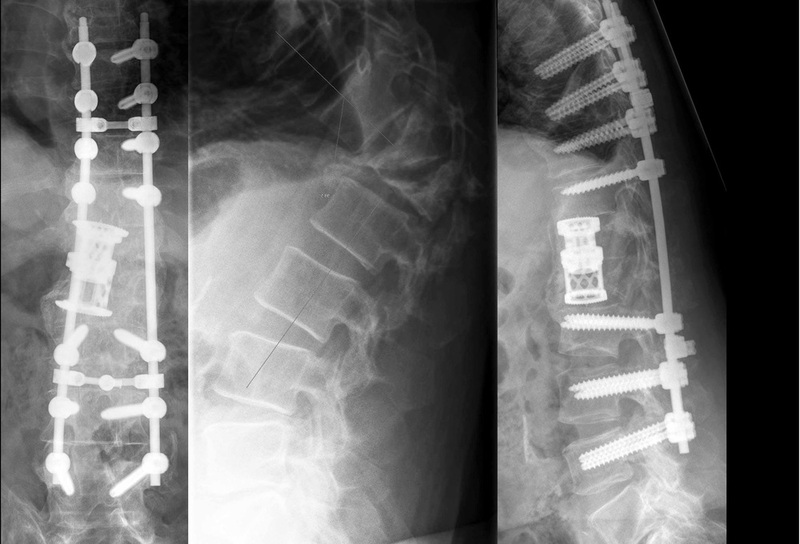 She was treated with posterior spinal fusion, ponte osteotomies, and fixation with titanium peticle screws and rods with excellent correction. This patient has returned to normal activities, including cheerleading at school. Comparison of pre-op and post-op PA view. Comparison of pre-op and post-op lateral view. Kyphoscoliosis is an abnormal curvature of the spine in two planes--front-to-back and side-to-side. It is named as such, as it's a combination of two conditions: kyphosis and scoliosis. It can occur at any age with no clear cause, and may come with a variety of symptoms. Visit Healthline for more detailed information about kyphoscoliosis. The case below is of a 67-year-old male who suffered increasing decompensation, or lean, to the right over the last 10 years. At consultation, the spine was decompensated to the right six inches. He complained of severe pain from his ribs contacting his pelvis, and some tingling in the right leg. Treatment was a pedicle subtraction osteotomy to tilt the spine back into normal alignment. Adult scoliosis is a result of disc degeneration and often associated previous idiopathic scoliosis. The curves are usually much stiffer and often associated with a decompensated posture. Visit eOrthopod for more detailed information about scoliosis. The case below shows a 46-year-old female with untreated adolescent scoliosis. As a result, she experienced a loss of height from 5'11" to 5'5". She is decompensated forward and to the right. She is experiencing disabling back pain. She was treated in two stages with lateral lumbar inter-body fusions followed by posterior spinal fusion, pedicle screw and rod fixation, and ponte osteotomies. She gained 3 inches in height, has relief of her back pain, and has significant improvement in her posture. Comparison of patient before and after operation. Note improved posture. 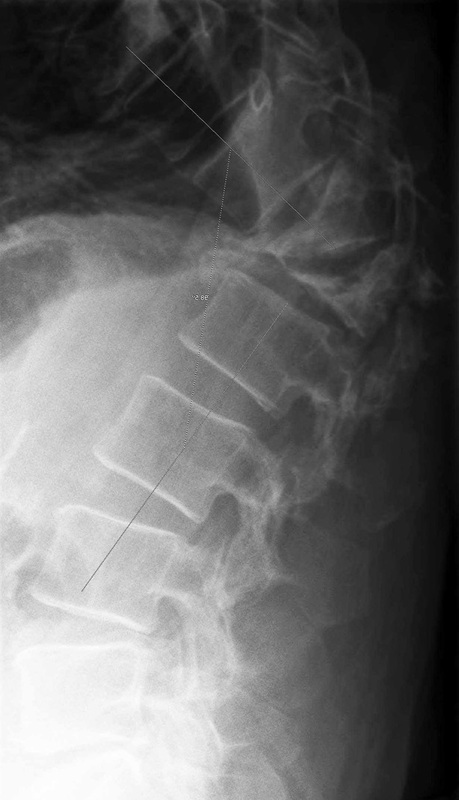 Sometimes a patient will present with a spine fracture that has healed in a unacceptable alignment. 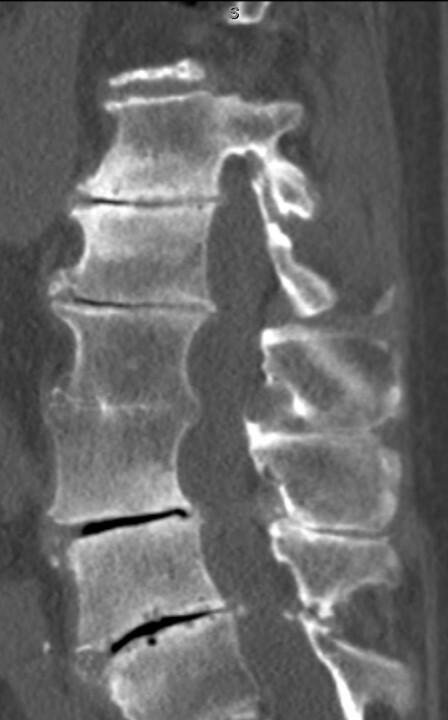 The case below is a 50 yo male with kidney failure who has wedged fractures of T12 and L1. This results in severe angulation of the spine of 90 degrees (normally 0 degrees). The patient was treated with removal of the vertebrae (vertebral column resection), straightening of the spine, and front and back fusion with pedicle screw and rod fixation.